Thank you to Norm's Farms for sending me a selection of their delicious Elderberry products to try in my home for a review. All opinions and words are my own. When I first started making some of my own snacks here at the house (granola bars are my specialty), I just know I would have to figure out a way to create fruit snacks and fruit leather. I already made jerky in the oven, so I figured I could probably employ my oven again to be a dehydrator. I wanted to include elderberry into my recipe because it has so many benefits and with spring on it’s way, I want to give my body what it needs to stay healthy. 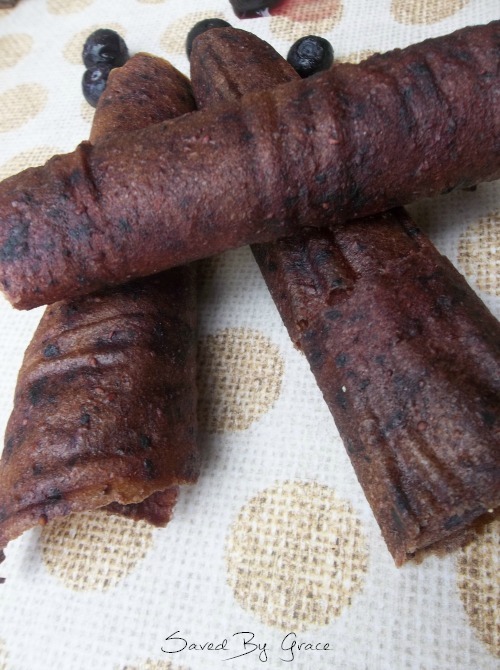 I like to make my healthy food and make it “junk” or at least trick myself into thinking it is so I made these Elderberry Blueberry Fruit Leathers. Elderberries contain a high amount of antioxidants. They actually contain a higher amount than blueberries, tart cherry and even goji berry. This makes it great to take to give your body a health boost*. 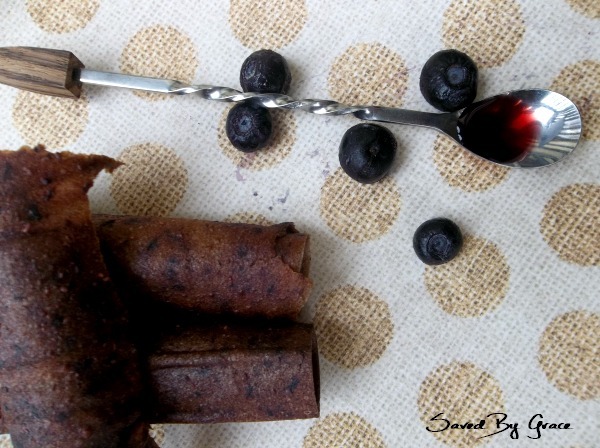 My elderberry fruit leather contains both elderberries and blueberries so it has an extra boost for health*. 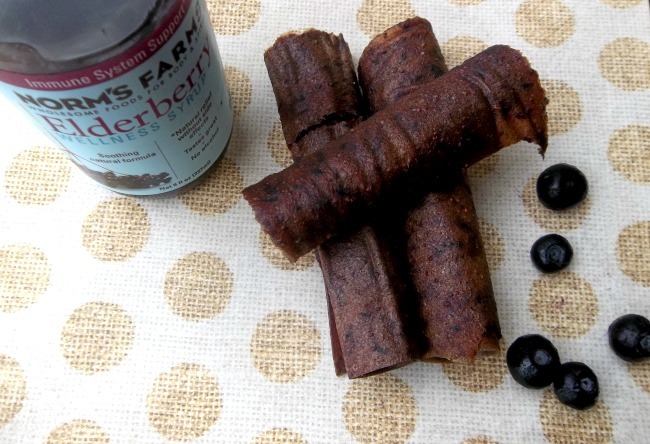 I chose to use the Norm’s Farms Elderberry Wellness Syrup rather than just plain elderberry syrup because it contains some extra ingredients like cinnamon, honey and cloves and I thought not only would it give the fruit leather some goodness, but it would add an extra element of flavor and subtle sweetness. I appreciate Norm’s Farm for sending me their product to try because Norm’s Farm stand by making sure they are sustainable and natural in their growing and manufacturing process and I really stand by them for that. I did try the syrup on it’s own and it is absolutely delicious. My whole family loves it, actually. Add your apple sauce to a high power blender such as a Ninja or a Vitamix. Pour in your blueberries and turn on to pulverize them. When that is well mixed, add your Norm's Farm Elderberry Wellness Syrup and mix again. Line 2 jelly roll pans with parchment paper. Pour your mixture onto them and using a spatula, spread evenly to ¼ of an inch thick or less. The thicker you leave it, the longer it will take in the oven, so you want it thin, but not so thin that you can see through it. Turn your oven onto the "warm" setting. Place your pans inside and leave on for 4-6 hours. They are done when they start to pull away from the paper and are no longer sticky or wet feeling. *These statements have not been evaluated by the FDA. This product and the statements contained herein are not meant to treat, cure or diagnose any aliment, disorder or disease. Please consult a physician. Thank you so much for sharing your wonderful creativity on The Inspiration Board at homework. I loved your project and featured you today. Thank you Carolyn! I appreciate that! Hi Christine. What a gorgeous looking recipe. I know my kids would absolutely love this and how healthy is it? Thank you so much for linking up to Thriving on Thursdays. It’s such a pleasure to have you visit me here. I’m featuring your recipe at tomorrow’s linky party. Hope to see you again. I am so excited to have found your recipe, thank you so very much. Last year I got a new Excaliber dehydrator and wanted to try a fruit leather but it was late in the season and I was not sure what to use. This year, I found your recipe and located elderberries on some state owned land near me where we walk our dog. I am so psyched to try your recipe in my dehydrator this year. I saw your bio about your immune system disease…and I am wishing you well. I can relate have Hashiomotos’ Thyroiditis and HS (repetitive bacterial skin infections.) 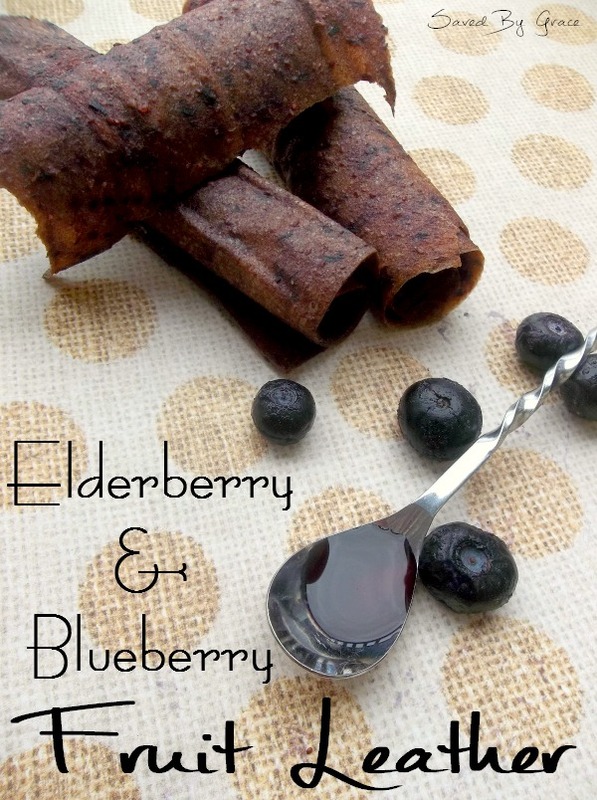 Do you find that the elderberry syrup helps your immune issues? I take elderberry syrup for colds and flu but have not though of it for other issues. Thank you for this idea. I will definitely be researching this now. I do all that I can to boost my immune system. I find that using elderberry syrup as well as good rest, diet and use of my biomat really help. I also love to get a good dose of exercise.